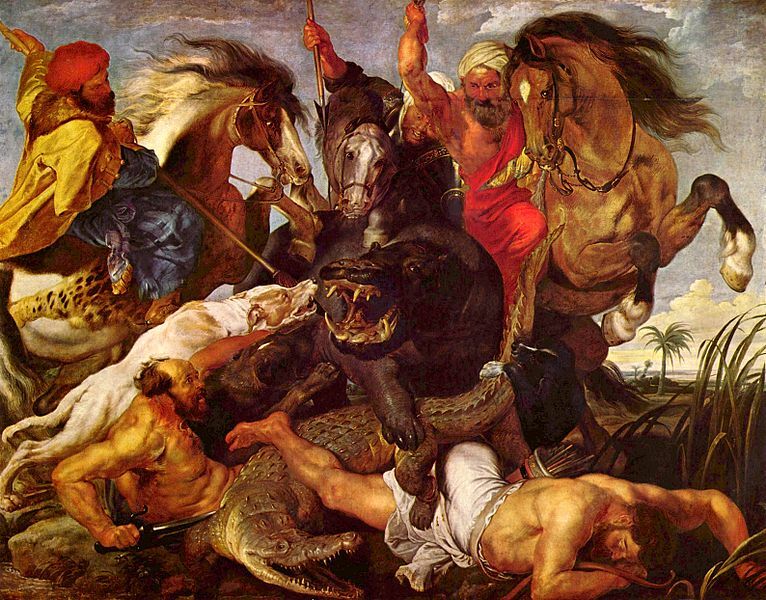 Flemish painter Peter Paul Rubens was born 28th Jume 1577. Rubens was a major seventeenth century artist And was a proponent of extravagant Baroque style that emphasised movement, colour, and sensuality, who was known for his Counter Reformation altarpieces, portraits, landscapes, and history paintingso mythological and allegorial sujects.In addition to running a lare studio in Antwerp that produced paintings popular with nobility and art collectors throughout Europe, Rubens was a classically educatd humanist scholar and diplomat who was knighted by both Philip IV, King of Spain, andChares I, King of England was raised as a Catholic. Religion figured prominently in much of his work and Rubens later became one of the leading voices of the Catholic Counter-Reformation style of painting (he had said “My passion omes from the heavens, no from earthly musings”). In Antwerp, Rubens received ahumanist education, studying Latin and classical literature. By fourteen he began his artistic apprenticeship with Tobias Verhaeght. Subsequently, he studied under two of the city’s leading painters of the time the late Mannerist artists Adam van Noort and Otto van een.Much of his earliest training involved copying earlier artists’ wrks, such as woodcuts by Hans Holbein the Younger and Marcantonio Raimondi’s engravings after Raphael. Rubens completed his education in 1598, at which time he entered the Guild of S. Luke as an independent master. In 1600, Rubens travelled to Italy. He stopped first in Venice, where he saw paintings by Titian, Veronese, and Tintoretto, before settling in Mantua at the court of Duke Vincenzo I Gonzaga. The coloring and compositions of Veronese and Tintoretto had an immediate effect on Rubens’s painting, and his later, mature style was profoundly influenced by Titian.With financial support from the Duke, Rubens travelled to Rome by way of Florence in 1601. There, he studied classical Greek and Roman art and copied works of the Italian masters, the Hellenistic sculpture Laocoön and his Sons was especially influential on him, as was the art of Michelangelo, Raphael, Leonardo da Vinci and Caravaggio. He later made a copy of that artist’s Entombment of Christ, recommended that his patron, the Duke of Mantua, purchase The Death of the Virgin(Louvre), and was instrumental in the acquisition of The Madonna of the Rosary (Kunsthistorisches Museum, Vienna) for the Dominican church in Antwerp. During this first stay in Rome, Rubens completed his first altarpiece commission, St. Helena with the True Cross for the Roman church of Santa Croce in Gerusalemme.Rubens travelled to Spain on a diplomatic mission in 1603, delivering gifts from the Gonzagas to the court of Philip III. While there, he studied the extensive collections of Raphael and Titian that had been collected by Philip II. He also painted an equestrian portrait of the Duke of Lerma during his stay (Prado, Madrid) that demonstrates the influence of works like Titian’s Charles V at Mühlberg (1548; Prado, Madrid). This journey marked the first of many during his career that combined art and diplomacy. He returned to Italy in 1604, where he remained for the next four years, first in Mantua and then in Genoa and Rome. In Genoa, Rubens painted numerous portraits, such as the Marchesa Brigida Spinola-Doria (National Gallery of Art, Washington, D.C.), and the portrait of Maria di Antonio Serra Pallavicini, in a style that influenced later paintings by Anthony van Dyck, Joshua Reynolds and Thomas Gainsborough. He also began a book illustrating the palaces in the city, which was published in 1622 as Palazzi di Genova. From 1606 to 1608, he was mostly in Rome but returned to Antwerp in 1608 and His return coincided with a period of renewed prosperity in the city, he was appointed as court painter by Albert VII, Archduke of Austria and Infanta Isabella Clara Eugenia of Spain, sovereigns of the Low Countries. In 1610, Rubens moved into a new house and studio that he designed. Now the Rubenshuis Museum, in the centre of Antwerp, it accommodated his workshop and made the most of his extensive collection of paintings, and his personal art collection and library,. During this time he created.Altarpieces such as The Raising of the Cross (1610) and The Descent from the Cross (1611–1614) for the Cathedral of Our Lady which were particularly important in establishing Rubens as Flanders’ leading painter . The Raising of the Cross also demonstrates the artist’s synthesis of Tintoretto’s Crucifixion for the Scuola Grande di San Rocco in Venice, Michelangelo’s dynamic figures, and Rubens’s own personal style. Sadly.Rubens died from heart failure, which was a result of his chronic gout on 30 May 1640. He was interred in Saint Jacob’s church, Antwerp. The artist had eight children, three with Isabella and five with Hélène; his youngest child was born eight months after his death.Rubens was a prolific artist. His commissioned works were mostly religious subjects, “history” paintings, which included mythological subjects, and hunt scenes. He painted portraits, especially of friends, and self-portraits, and in later life painted several landscapes. Rubens designed tapestries and prints, as well as his own house. He also oversaw theephemeral decorations of the Joyous Entry into Antwerp by the Cardinal-Infante Ferdinand in 1635.His drawings are mostly extremely forceful but not detailed; he also made great use of oil sketches as preparatory studies. He was one of the last major artists to make consistent use of wooden panels as a support medium, even for very large works, but he used canvas as well, especially when the work needed to be sent a long distance. For altarpieces he sometimes painted on slate to reduce reflection problems.His fondness of painting full-figured women gave rise to the terms ‘Rubensian’ or ‘Rubenesque’ for plus-sized women.Rubens was a great admirer of Leonardo da Vinci’s work. Using an engraving done 50 years after Leonardo started his project on the Battle of Anghiari, Rubens did a masterly drawing of the Battle which is now in the Louvre in Paris. More of Rubens valuable paintings have also recently been discovered in Oxford.